Leave it alone. Most bites occur when individuals or dogs provoke the rattlesnake or if you try to capture or kill it. Rattlesnakes only bite or attack in self-defense, so the best way to avoid being bitten is to leave the rattlesnake alone. 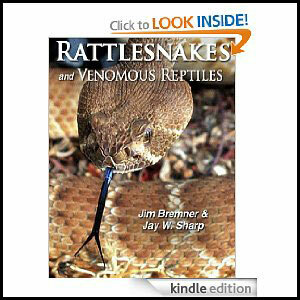 Many people spend a lifetime hunting, fishing or otherwise enjoying the outdoors and never see a rattlesnake. Very few people are actually bitten by rattlesnakes, yet because the bite is extremely painful and can be fatal, you should always keep alert and watch where you step or put your hands when you are in the field. Be careful after dark as well, for on warm nights rattlesnakes are out and about searching for food. Most rattlesnakes, when disturbed, normally try to withdraw, but if they think they are cornered, the explosive sizzling buzz of their rattle is an unmistakable warning to retreat and is a sound that will long be remembered. Be sure to walk or hike in areas where you can see the path and where you step or reach with your hands. Use a walking stick or other device to rustle the shrubs along the side of route to alert snakes of your presence. Wear high boots or hiking boots, long pants and gloves (when using your hands to move rocks or brush). Don't put your hands or feet in areas where you cannot see such as on a ledge, in a crevice and use caution when you pick up rocks or debris where a rattlesnake may be hiding. One of the most common fears of pet owners is that their dog or cat will be bitten by a rattlesnake. Rattlesnake avoidance classes designed to train your dog to fear and avoid rattlesnakes is one way to approach the situation. There is also a pet rattlesnake vaccine, but there is some controversy over how effective it really is. Talk to your Vet about the pros and cons of vaccinating your dog or cat with the rattlesnake vaccine. Here are some additional tips on how to protect your pets from rattlesnakes. Always keep your dog or pet on a leash when outside of your home or away from your yard. 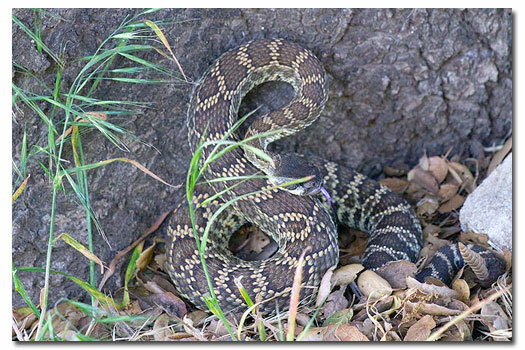 Don't let your dog wander into tall grass or thick shrubs where rattlesnakes may be hiding. Be careful along streams and riverbeds as snakes are often found in the tall grass near water sources. If you encounter a rattlesnake stay a minimum of 10' or more away from the snake and walk around the area or take another route. Always have a nearby 24/7 Vet Hospital phone number and address with you when you venture out to hike with your dog and keep emergency numbers in an easy to find location at home. Enroll your dog in a Rattlesnake Avoidance Class from a local dog trainer who has experience training dogs to avoid rattlesnakes. Ask your vet if he or she feels a rattlesnake vaccine is appropriate for your dog. A rattlesnake proof fence is one of the best ways to keep snakes out of your yard. It may be expensive, but worth the investment once you realize how expensive a visit to the emergency vet clinic will be. A snake-proof fence should be a minimum of 3' tall with the bottom portion of the fence buried at least 3" or more. Gates should have no gaps on the sides and be flush with the ground. Concrete slabs placed under the gate are even better. For your fencing material, use mesh that is not more than 1/4" in diameter or a solid material that is smooth. Snakes cannot climb smooth surfaces. Here are some additional tips on how to snake proof your yard. Keep the grass in your front and back yards cut short. Clean up any debris in your yard including piles of wood, leaves, or any other materials that a snake could hide under. Control rodents in your yard and around your home: pick up fruit on the ground, keep trash cans closed with lids and don't leave pet food out. Remove birdfeeders as they attract small rodents which rattlesnakes prey on. Keep any vegetation from growing up or over the fence as snakes can use it as a way over the fence. Check under your house and around the perimeter to close any gaps or holes where a rattlesnake could hide. Fill in or block any holes or gaps were a snake can hide or slip through the fence or under your house. How To Identify A Rattlenake. Are baby rattlesnakes more dangerous than adult rattlesnakes?